After nine decades, Gilman Hall — the heart of the Homewood campus — is showing its wear. An ambitious renovation aims to bring the building into the 21st century, while preserving its stately sense of tradition. It seems only fitting that Gilman 500, the tower room, would be as stately inside as it is outside. 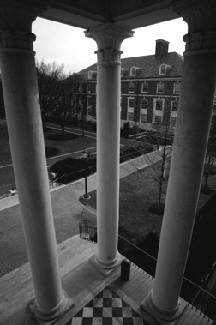 After all, the Gilman Hall clock tower is a landmark, a symbol of Johns Hopkins and its history. In reality, the tower interior is a storeroom of forgotten stuff. A mound of chicken wire lies in a tangled heap in one corner. Discarded wall-to-wall carpeting is piled in another. The sky blue paint on the walls is peeling, and stuffing pokes out of the mismatched chairs clustered around the scarred wooden seminar table. The light-filled classroom underneath the bell tower screams forgotten, threadbare, rundown. Yet it works somehow. On a recent Friday afternoon, students in Marc Lapadula's screenwriting class hang on the professor's every word. They are lost in the story he is telling about a college reunion — complete with dashed youthful delusions of grandeur, a mystery girl, and a plot twist involving an insane asylum. It's an ivory tower, but it's also a room for big ideas, a room where anything is possible. "My best classes are in this classroom," says Writing Seminars major Jennifer Diem. "Whoever designed this building designed it with this in mind: You dream big in this room," says Lapadula, who has taught Friday afternoon writing classes in the tower room for the last decade. He stops to consider his words. "Big is too little a word to describe how big you dream in this room." Back in 1915 when Gilman Hall opened its doors, Johns Hopkins University's forefathers were dreaming big about having a permanent home for the first research university in the United States. Gilman was the first major academic building on the Homewood campus, a home for the humanities departments. With its high ceilings, huge windows, and grand reading room, the building was as beautiful as it was practical. Johns Hopkins was created after the German model of scholarship that emphasized instruction through seminars. Faculty offices, classrooms, and seminar rooms were built around a core of library stacks filled with books that teachers and students would use in their academic pursuits. Gilman Hall has always been the center of the Homewood campus — the place where students endure all-nighters in the Hut, defend dissertations, meet with professors, and buy cups of coffee and books for class. "For me it will always be the heart of the campus," says Ross Jones, A&S '53, Johns Hopkins vice president and secretary emeritus. "Its very location in the center of campus and the departments located in it make Gilman a magnet for hundreds of students." But after nine decades of continuous use, Gilman Hall is showing its wear. It's too hot in some rooms, too cold in others. The plumbing is quirky, the lighting is poor, and the academic departments housed there have long since outgrown their allotted space. "It's bursting at the seams," says Classics Chair Matthew Roller, whose department has offices spread over three floors. "There is constant jockeying for space." Just like Victorian houses that retain their classic exterior but get their interiors updated with granite countertops, central air, and other modern amenities, Gilman needs to be brought into the modern age. Proposed renovations to the building, the first major changes to the interior since the structure was built, are timed to coincide with the relocation of two banks and the university bookstore (long housed in the basement) as well as the Gilman stacks. The $35 million project aims to improve the building's heating, electricity, and plumbing; modernize classrooms with audio-visual capability; and give more work space to academic departments. "One hundred years of students have formative memories of Gilman Hall," says Adam Falk, dean of the Krieger School of Arts and Sciences. "What we're trying to make sure of is that another hundred years of students have memories that are just as lasting." It is early on a brisk fall morning, and in the basement of Gilman Hall the din is incredible. There is shrieking and thudding, wheezing and banging, popping and squeaking. 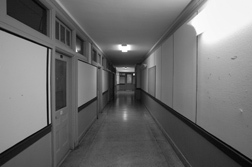 The noise echoes through the empty classrooms and down the dim corridors, making it difficult to think and nearly impossible to talk and be heard. The culprits are four feet long, two feet wide, and painted chocolate brown: radiators. Each room has at least two of them, hulking noisy monsters ready to impose their clanging wrath at a moment's notice as their pipes expand and contract with steam heat. "Before last spring I was unaware of the daily battle between humanity and the radiators occurring on the basement level," says Tara Bynum, a graduate student in English, who taught her first class in Gilman's basement last year. The first day, just after introducing herself, she recalls, "the rumble began — a slow steady banging." As the semester wore on the muffled noise gave way to a top-volume banging. "We had to yell above the melodic clanging," she says. The cacophony isn't limited to the basement. 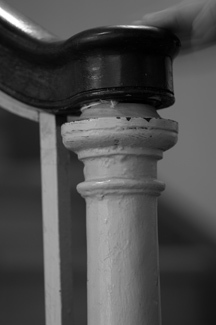 Offices and classrooms around Gilman Hall offer audience to the radiator symphony throughout the day. "You should hear this one in the afternoon," English Department academic coordinator Susie Herrmann says, pointing to a radiator in Gilman 146. "When it gets going it sounds like Ricky Ricardo playing the drums." There is no reliable way to control the noise or the temperature in Gilman Hall, which lacks central air-conditioning as well as thermostats in rooms. So professors usually leave their classroom doors and windows open — that is, until the clamor of people going to the bookstore and the buzz of lawnmowers outside force them to retreat into their cold/hot quarters. And then there's the maze of the place. Gilman Hall has four floors, not including the tower room. The first one and a half floors are below ground, which means that the bulk of the building is largely concealed from the front. From the main entrance Gilman looks like a two-and-a-half story building, but from the rear, all four floors are visible. 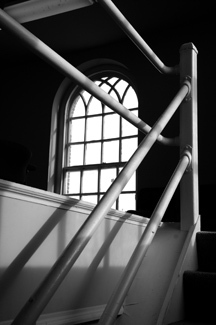 Then take into account that Gilman has a myriad of staircases that don't go to every floor, entry doors on multiple levels, and doors that open into landings in between floors and you're likely to lose your way — even if you know the place well. "In Gilman you never know where you are," says Mame Warren, a Hopkins historian who spent hundreds of hours at Gilman Hall when she was researching the university's history, Knowledge for the World, in 1999. "No matter how much you think you know where you are, you're always surprised where you come out." In 2000, the campus satire magazine, Black and Blue Jay, ran a fake news story about a freshman who was found dead three months after becoming lost in the building. "This tragedy has left many people befuddled by the confusing nature of Gilman Hall, which rises four or five stories and has twice as many doors [as] classrooms," the article reads. "One question immediately comes to mind: Is it really possible that a building can kill someone?" Some offices can only be accessed by walking through narrow corridors that lead back to warrens of little rooms. Other offices, such as the one belonging to Linda DeLibero, associate director of Hopkins' Film and Media Studies program, are tucked away in random corners of the building, way, way off the beaten track. "People are always stopping me and asking me for directions," says DeLibero, who came to Hopkins as a Writing Seminars grad student in 1987 and has been here ever since. "I understand their pain." Worse than the confusing layout of the place is the fact that Gilman is technologically outdated. Humanities scholarship has changed dramatically in the last century, and smart classrooms equipped with integrated multimedia stations have become a necessity for many scholars, including Stuart "Bill" Leslie. Two times in the last year, the History of Science and Technology professor has asked the Registrar's Office to move his classes assigned to Gilman Hall to other buildings that better suit his technology needs. Leslie regularly uses visual text, film, and music in his teaching. 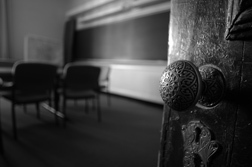 "When Gilman was built the ideal educational experience was the great professor. You didn't need anything else," Leslie says. "We don't teach like that anymore. Both professors and students are much more visual today." Leslie's department moved out of Gilman a few years ago because of a lack of space. His office is now located in a charming former residence on North Charles Street. However, he'd rather be back in Gilman. "Gilman matters. It matters a lot," he says. "Being in an intellectually isolating place like we are now, something gets lost. So many of your ideas come from serendipitous interactions with people in other departments. Gilman gives you those interactions." What's funny about Gilman Hall is that no matter how much people profess to dislike the building, they still usually find something nice to say about it. 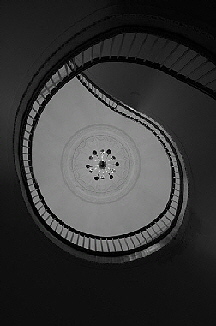 Some refer to the building's character, its sense of history, and its architectural detail. Others rave about its grand front room; the stained glass windows in the undergraduate Hutzler Reading Room (the Hut); and the majestic faculty offices with their quadrangle views, fireplaces, and floor-to-ceiling bookshelves. Falk sees it this way: "Gilman has a soul," he says. "The reason people love Gilman despite its flaws is that it fosters their experiences in an intellectual community. That's what they value and don't want to lose." In his 20-plus years at Hopkins, professor emeritus of English Larzer Ziff has taught in just about every room in Gilman Hall. He's suffered through bad lighting and hallway traffic, loud radiators, and windows overlooking the bookstore loading dock. "You go to a neat little classroom in Ames and it's kind of antiseptic," he says. "Then you teach on the basement level where the traffic is constant and it's kind of like being in a fishbowl and it has its... its..."
"No," Ziff says. "It's not exactly charm, but it's Gilman." Qith its graceful columns and soaring clock tower, fine arched windows, and walls of simple red brick, Gilman Hall's Georgian design echoes that of Charles Carroll's Homewood House. It set the tone for the design of other academic buildings on campus. "Here is the Carroll Mansion's prophesy come to fulfillment," Johns Hopkins librarian M. Llewellyn Raney wrote in Johns Hopkins Magazine in January 1913. "Homelike, simple, dignified, preserving the old portico multiplied by two, it is at once marked as the capital of campus by the clock-tower, which rises 120 feet from the ground level, inevitably carrying one's mind back to Independence Hall." Gilman Hall was designed by architect Douglas H. Thomas, who graduated from Hopkins in 1893. Built for about $620,000, it was named for Daniel Coit Gilman, the university's first president. Gilman's presence can be felt primarily in the building's vestibule, where his portrait in bronze hangs over one of two fireplaces. Books from his personal library line the bookshelves flanking the front entrance, and his career as a university president is chronicled in five stained glass windows. Perhaps what is most remarkable about the design of Gilman Hall is how it embodied the university's mission. "The building expresses in its original architecture and design the idea of a research and teaching university," Hopkins facilities architect David Guth explains. "The building looks traditional but the idea behind it was radical." Placing faculty offices and classrooms around the perimeter of Gilman, then building five floors worth of library stacks at the core meant that both faculty and students had easy access to the library for teaching and research. "Originally the library for the entire campus was in Gilman Hall," explains university archivist Jim Stimpert. "The idea was to locate materials from a certain discipline in the same location of the faculty who taught that discipline." A professor could get up in the middle of class, walk across the hall, and get a book he needed to support a particular discussion, Stimpert says. To this day, the aroma of musty books suffuses the building's hallways, a nod to the 240,000 volumes that remain housed in Gilman's core. Much of the original humanities library was relocated to the Milton S. Eisenhower Library when it was built in 1964, but the Gilman stacks are still used to store some 20,000 dissertations; copies of early journals and periodicals like Le Moniteur Universel; and materials like the Trade Union Collection, a group of materials produced by unions and employers' associations dating from 1900 to 1964. "This is a treasure trove of history, particularly primary source material," Cynthia Requardt, curator of special collections, says of the stacks. 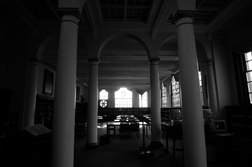 Myth #1: The library stacks in Gilman Hall are holding up the building. Truth: The stacks in Gilman are freestanding inside the core of the building, according to Larry Kilduff, executive director of facilities operations at Hopkins. They are not part of any structural system that supports the building, he says. 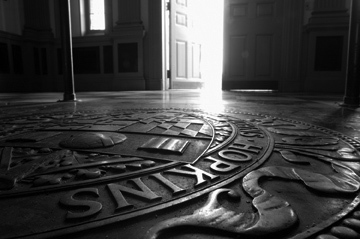 Myth #2: Walk over the seal in the foyer of Gilman Hall as a prospective student and you won't be accepted. If you are a parent of a Hopkins student you won't receive financial aid. If you are a current student you won't graduate in four years. If you are a faculty member you won't get tenure. Truth: This one's impossible to refute, but campus tour guide Liz Kramer says, "I've never known the myth of the seal to be true." Kramer used to avoid walking over the seal, she says. "But once I realized I was going to be here for more than four years, I started walking over it all the time." �Myth #3: As part of his will, Daniel Coit Gilman stated that no building on campus could rise taller than the clock tower of Gilman Hall. It also forbade any other structure on the Homewood campus from obscuring the view of "his" clock tower from Charles Street. Truth: "There is nothing in Daniel Coit Gilman's will mentioning a clock tower, or any building bearing his name," says university archivist James Stimpert. It is for aesthetic reasons, not legal ones, that architects decided to build most of the Milton S. Eisenhower Library underground, Stimpert says. Originally, not just the humanities departments but also the biology and psychology departments found space in Gilman Hall. As new campus buildings were built, the sciences moved out, leaving Gilman "a warehouse of humanists," as the Classic Department's Roller jokes. Two humanities departments — History of Art, and History of Science and Technology — have been forced to move to other buildings due to lack of space. Now the building is home to nine departments: Classics, English, German, History, the Humanities Center, Near Eastern Studies, Philosophy, Romance Languages and Literatures, and the Writing Seminars. In this warehouse, scholarship has flourished. "Gilman is very much a building that's been the center of intellectual life on campus for years," says Frances Ferguson, a Hopkins professor of English and Humanities who has taught in Gilman for much of the last 30 years. As she sits in her book-strewn office, she reels off the names of some of the university's past noted humanities scholars. There was Arthur O. Lovejoy, history professor from 1910 to 1939, who is credited with the introduction of the interdisciplinary area known as the history of ideas; William Foxwell Albright, A&S '16 (PhD), the first major scholar to authenticate the Dead Sea Scrolls; and world-renowned Dante and Boccaccio scholar Charles Singleton. Other notables: German professor William Kurrelmeyer, A&S 1896, who chaired the German Department for 30 years and donated 25,000 books from his collection to the MSE Library when he retired; Earl Wasserman, A&S '37, an expert on Romantic poetry who helped create the field of critical theory; and philosopher George Boas, a history of ideas adherent and prolific writer. Humanities scholarship at Hopkins has continued to flourish in more recent decades. "One of the things that's very distinctive about Hopkins is that it has unusually high-level, remarkably small departments in the humanities. We're able to do an awful lot without having a huge faculty," Ferguson says. And because all of the humanities departments are housed together, "people know about and take an interest in things happening in departments other than their own," she says. "Last week I was at three humanities lectures — only one of which was sponsored by my department. I have been at other places — serious universities — but I don't know of any place that has as much intellectual exchange across department lines as Hopkins does." Also facilitating this interchange of ideas is Hopkins' long tradition of class and departmental seminars. Hopkins was the first American university to institutionalize seminars as the preferred method of instruction for students. In the 1880s, Johns Hopkins history professor Herbert Baxter Adams established the tradition of inviting visiting scholars to lead seminars involving faculty and students. Over the years, the heated discussions that have taken place in Gilman seminar rooms have become the stuff of legend. John Russell-Wood, a former chair of History, tells tales of history seminars in which the crowd of faculty and students overflowed into the hallway. Wine was served to loosen the discussion, and the featured speaker had to endure 90 minutes of pointed questioning. "People were glad to survive the seminars," he says. hen giving a tour of the Homewood campus, senior Liz Kramer always makes sure to take prospective students and their parents up the front stairs and through the pillars into Gilman Hall. Once inside, she tells her group about the seal on the floor of the foyer, the one that students aren't supposed to step on if they want to graduate. She tells them about the 19 stained glass windows in the Hut that bear the names and seals of 15th-century European printers. Kramer does not show them the basement. "If I did, would anyone ever come here?" she asks. Certainly it is the Gilman vestibule — with its black-and-white marble floor, slouchy couches, and two ornately carved fireplaces — that is the main public showplace of the building. But after renovations are complete, it won't be the only interior space in Gilman worthy of the campus tour. "Gilman has passed the point where its problems are still lovable quirks," says Falk. "We need to make it function as a building. The heating, lighting, and plumbing have to work, and the noise level has to be manageable. Secondly, the building has gradually ceased to be as supportive of the work that goes on here and as nurturing of the community as it once was. We need to change that." Proposed changes to the 110,000-square-foot building include transforming the basement into new homes for the departments of Near Eastern Studies, Classics, and the History of Art. Space now occupied by the post office will house the Archaeological Collection. Elsewhere in Gilman changes will include new elevators, central heating and air conditioning, a new plumbing system, enhanced lighting, and classroom and seminar rooms that have the same modern multimedia capabilities as newer classrooms on campus. When all of the materials in the stacks get moved to a new storage facility at Hopkins' Applied Physics Laboratory — a process expected to start this spring — Gilman Hall will gain new space for mechanical rooms, bathrooms, seminar rooms, offices, and work areas for graduate students. The design review board for the Gilman project expects to select an architect and a construction manager this spring. Construction on the first phase could begin as soon as spring 2007 and take 18 months. Plans are to keep Gilman operating throughout the entire renovation, which could take years to complete, says Larry Kilduff, executive director of facilities operations. There have been other proposed renovations to Gilman Hall, plans for which fundraising fell short. Falk says this project is different because it will be tackled in phases as funding becomes firm. "It's not an option to not renovate this building," Falk says, noting that fundraisers are nearing their goal of $15 million needed for the first phase. After the renovation, Gilman's exterior won't look much different. Inside, it will better meet the needs of the departments housed there while maintaining its sense of tradition. "The last thing we would want to do is to take Gilman and gut it and turn it into a sterile space," Falk says. "Hodson is a great building, but we don't want another Hodson." Late on a Monday afternoon, Gilman Hall is mostly quiet. The students have moved on to the library, to sports practice, to their dorm rooms. Most of the faculty offices are dark. Many classrooms are, too. But Gilman 315 draws several dozen people in a steady stream. The Tudor and Stuart Room (Gilman 323): Stately oak cabinetry, leather furniture, and a fireplace decorate this sumptuous room (above) designed as a memorial to the son of Sir William Osler. Edward Revere Osler, who was killed during World War 1, was a collector of rare books, some of which are housed in the room. The Tudor and Stuart Club, founded and endowed by Sir William Osler, met in the room and focused on the study of English literature in the Tudor and Stuart periods. 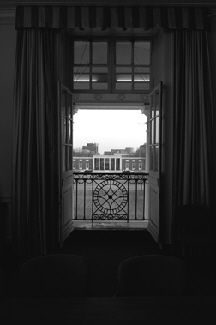 The room is now used as a seminar room by the English Department. The Sidney Lanier Memorial Room (Gilman 329): The room was dedicated in 1942 as a memorial to poet Sidney Lanier, the poet laureate of Georgia who lectured at Hopkins from 1879 to 1881. Lanier's desk, letters, and manuscripts have been moved from the room to the Sheridan Libraries. But the entrance to the room remains the same. It's the exterior door to Lanier's former house in Baltimore and bears the plaque "33 Denmead St." Above the doorway reads Aspiro Dum Exspiro ("I aspire until I expire"). The room currently serves as the Classics Seminar Room. The History Seminar Room (Gilman 315): The room, with its walnut Renaissance Revival book cabinets, is stuffed with historical artifacts chronicling Hopkins' History Department. "I love the way we've turned it into a memorial of ourselves," says history Professor Ron Walters. The centerpiece of the seminar room is an antique cherry seminar table that was built by hand in the 1860s or 1870s. A drawer in the desk is believed to bear the scratchings of alumnus Woodrow Wilson (his name in block letters). It has been like this since Gilman opened its doors 90 years ago. Just about every Monday at 4 p.m., the History Department invites a scholar to present his or her work. The visitor's paper is circulated in advance and the seminar is open to all. There is no assigned seating, although History faculty usually take the seats at the antique cherry seminar table and graduate students and faculty from other departments sit in the chairs lining the walls or on the floor. Gabrielle Spiegel, A&S '74 (PhD), History Department chair and acting chair of faculty, introduces the day's speaker, Thomas Laqueur, a historian from the University of California, Berkeley. He explains that his paper, "Making the Dead Clean Again: Cremation and Afterlife of Bodies," is a chapter from a forthcoming book about death. The paper is "an effort to think about the history of cremation in the late 19th and early 20th century as part of a more general history of what death and the dead body have come to mean in the past couple of centuries," he says. His goal: to explore "a politics of the dead" that is parallel to a politics of the living. The charming and erudite Laqueur speaks for about 15 minutes and is received with appreciative nods and chuckles. Then he opens the floor to questions. Anyone in the room can pose one, and it is here that the seminar begins in earnest. "This is a training in critical thought," Spiegel explains. "What we are trying to do is to read the work from the inside and to understand what the writer is trying to do and whether or not it is successful." For the next 75 minutes, the words fly. The discussion is lively, and the criticism is sharp and insightful as dozens of questions are answered. History professor David Bell pronounces Laqueur's paper "ambitious," "fabulous," and "full of interesting ideas." Still, Bell has questions. Laqueur had argued that the period saw a shift from treating human corpses with reverence, under the authority of the Christian churches, to treating them as waste material. He argued that the arrival of such practices as cremation, and their general acceptance, signified a move toward a more scientific, less spiritual conception of the dead human body. But if this shift is really the important one, Bell asks, why was there such emphasis on keeping the ashes of individual dead people separate from one another? Laqueur listens carefully and nods in agreement. Bell's question deserves further research, he thinks. He makes a note to follow up. He's not the only person taking notes. Joseph Adelman, a second-year graduate student specializing in the American Revolution, carefully watches the seminar unfold and takes it all in. Adelman is familiar with the nervousness that goes along with asking a question in such a gathering of distinguished scholars. He is familiar, too, with the different ways people receive criticism about their work. But for him the value of the seminar is that it shows scholarship in process. "You really get to see the faculty in action," he says. "There are a lot of different perspectives presented, and you get to see a range of work that people outside Hopkins are doing." As questions bounce back and forth and radiators hiss and clang inside Gilman 315, Adelman thinks ahead to his own work. He wonders how one of his papers might fare in a history seminar, what questions might get asked, what issues might be raised. He sits there. And he listens. Maria Blackburn is a senior writer at Johns Hopkins Magazine.